Flettner Fl 282 "Kolibri" was an early ancestor of helicopters with intermeshing rotors. Intermeshing rotors on a helicopter are a set of two rotors turning in opposite directions, with each rotor mast mounted with a slight angle to the other, in a transversely symmetrical manner, so that the blades intermesh without colliding. The arrangement allows the helicopter to function without a tail rotor, which saves power. However, neither rotor lifts directly vertically, which reduces efficiency per each rotor. This configuration is sometimes referred to as a synchropter. Yaw is accomplished through varying torque, which is done by increasing collective pitch on one of the blade sets. Most intermeshing designs have two blades per mast, although exceptions such as the Kellett XR-10 with three blades per mast do exist. 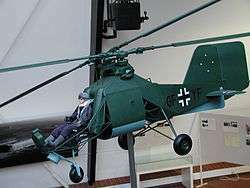 The arrangement was developed in Germany by Anton Flettner for a small anti-submarine warfare helicopter, the Flettner Fl 265 and later the Flettner Fl 282 Kolibri. 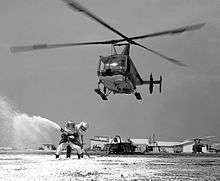 During the Cold War the American Kaman Aircraft company produced the HH-43 Huskie, for USAF firefighting purposes. One example of the Kaman K-225 experimental synchropter was fitted with a small turboshaft engine in late 1951, becoming the world's first gas turbine powered helicopter. Intermeshing rotored helicopters have high stability and powerful lifting capability. The latest Kaman K-MAX model is a dedicated sky crane design used for construction work, and has been modified for trials by the USMC as an optionally-unmanned cargo transporter. ↑ Day & McNeil; Lance Day; Ian McNeil (1998). Biographical Dictionary of the History of Technology. Taylor & Francis. p. 261. ISBN 0-415-19399-0.